Another month, another freebie. 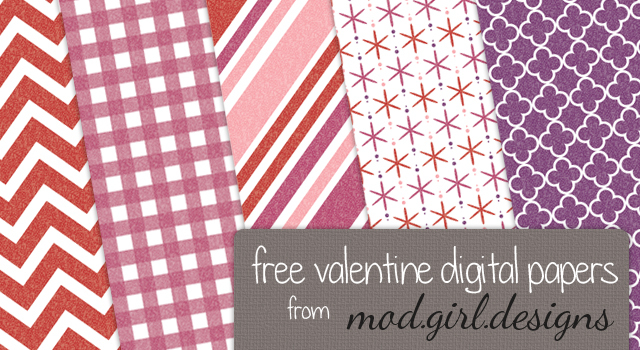 This set of 8.5×11 high resolution digital papers are perfect for creating one-of-a-kind Valentine’s Day crafts. Print them as you need them or use them for your digital scrapbooking projects. All you need to do is like my Facebook to start your download. And by liking my page you’ll never miss out on another giveaway! 1. mod girl design “freebies” are for personal use only, if you own a business and would like to use any of my freebies, give me a shout. 2. Do not distribute or claim my content as your own. 3. If you like my content, please tell your friends where they can find it too! Technical Issues? Let me know.